Jconnect Executive Director, Cheston Mizel and wife, Laura, explain the history of Jconnect's five Purimpaloozas. Jewish-Americans celebrate Am Yisrael's survival on Purim - mindful of the need to defend it against those who make Jewry their enemy in each generation. Jconnect makes the religious and the cultural expression accessible to the new generations. Kabbalistic Artist's Paintings "World of Unlimited Possibilities" Exhibited in L.A. The artist, Benson Simmonds, known for his acting, dramatic instruction, and paintings, opened a 24-hour charitable show Tuesday 18 March, The World of Infinite Possibilities. Live, jazz entertainment was performed by at the opening by the talented and gracious, Richard Glazer Jazz Trio. Singer/songwriter Mary Rand (www.myspace.com/maryrand/) also entertained. The show ran at SPF:a (www.spfa.com/) 8609 Washington Blvd, Culver City, Calif 90232. 30% of art sale proceeds will go to For the Child to help child victims of domestic violence. NBC Today Show's video: skeptical, dangerous South Bronx Jr High School undergoes transformation from worst to first- under rookie Principal Shimon Waronker - a Spanish-speaking, Lubavitcher Chassid. 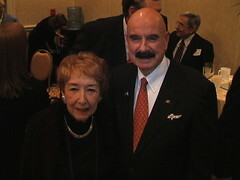 G. Gordon Liddy, prior to speaking-out against anti-Semitism and over-restraining Israeli self-defense. He addressed the first Judeo-Christian, "Proclaiming Justice to the Nations" Alliance dinner. Pictured chatting with Unity Coalition for Israel's Director, Esther Levens, at the National Religious Broadcasters Convention in Nashville. 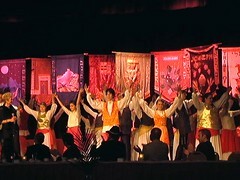 A pageantry of folk-dances and banners representing the 12 tribes of Israel adorned the Proclaiming Justice to the Nations' dinner at the NRB in Nashville. ·Promises to fund his other promises by a rapid withdrawal from an unpopular war -- with the hope, I suppose, that the (presumed) resulting increase in American prestige would compensate for the chaos to follow. President Bush waived congressional restrictions to directly transfer $150 million to the Palestinian Authority. President Bush waived congressional restrictions to directly transfer $150 million to the Palestinian Authority. The transfer ordered Friday is part of a package of more than $500 million in Palestinian assistance earmarked for use this year. Congress in recent years has banned direct transfers of cash because of fears that the money could end up in terrorist hands and because of concerns about P.A. corruption. Much of the pro-Israel community also strongly opposes direct transfers. The Bush administration says the Palestinian Authority needs the cash to leverage loans at a time that it is confronting extremists and pursuing peace talks with Israel. (AP) Dutch Parliamentarian Geert Wilders said Monday he has begun negotiations with Dutch broadcasters about airing the 15-minute film, "Fitna." He said he will only allow them to show it in its entirety, and if they refuse, he plans to show it to the media and post it on the Internet. If it airs, Dutch Muslims are expected to file criminal complaints for racial or religious vilification. Prosecutors would then have to decide whether to charge Wilders with any offense. Will accuracy be a defense in that event? 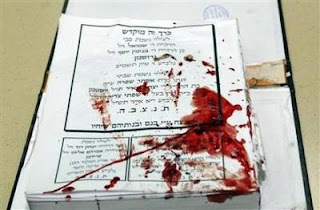 After all, the Qur'an does teach violence against, and the subjugation of non-Muslims (see 9:5, 9:29, etc. etc.). And jihadists do point to such verses to justify their actions. So if Wilders' film sticks to the facts, will it really constitute religious vilification? JEDDAH, 3 March 2008 — Early morning shoppers at a supermarket in Jeddah were left reeling yesterday, with some falling unconscious, after a well-built Syrian man clinched a knife and decapitated his 15-month-old nephew in front of his mother in the store’s fruit and vegetable section. Saudi royals withhold oil-riches from human-welfare programs, leading Muslims to steal wallets from Mosque pray-ers. Police said they had received reports from a number of locals that their wallets had been stolen while attending prayers in a mosque located in the north of the capital. Police later monitored the mosque and were able to apprehend one suspect, who had in his possession a stolen wallet. The man led police to his accomplices. Riyadh police announced that they apprehended three suspects — two of them of Arab nationalities and the third an African — in connection with a number of muggings in Riyadh, the capital. Over the past year armed robberies have increased in the capital at an alarming rate. Police have exerted efforts in apprehending suspects, the majority of them local youths who are also involved in car thefts and muggings. In one incident reported by the local police a few months ago, three suspects threatened a foreign worker in a grocery store with a machine gun. 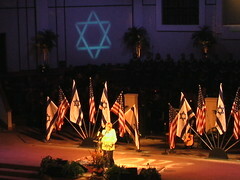 Los Angeles metro-area experiences 2 Judaic-themed happenings within 3-weeks. Check-out some of Jewlicious 4.0's name-act, Jewish-pride, musical highlights. Rav Shmuel confronts the pain of prejudice against Jews with humor, performing his "Protocols of the Elders of Zion" for the Jewlicious Festival audience. 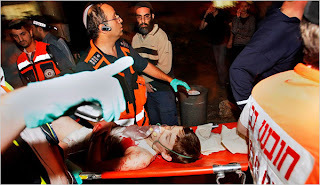 Moshav inspires Yids to "Come Back" to their motherland. Y-Love combines cultures in spiritual rap and hip-hop. Debbie Friedman's medley of folk and freilach had the broad spectrum of gals and guys at LimmudLA turning the whole venue into a dance party. COSTA MESA, Calif. (JTA) -- It was the Karlin-Stoliner rabbis in the Havdalah congo line that had everyone buzzing.Sure, there were great workshops, spirited davening, morning yoga and late-night shmoozing, and all the other multigenerational, multidenominational, plura-palooza that Jews in the know have come to expect from the Jewish learning extravaganza known as Limmud, which made its Los Angeles debut this past weekend.But of the dozens of sessions that took place over three days -- from a midnight screening of the low-budget Chasidic zombie movie “Night of the Living Jews” to Deborah Lipstadt’s Sunday morning talk on Holocaust denial -- what stuck in the minds of many of the 650 participants was the two Chasidic guys in their long black coats and fur shtreimels. Mrs. Deidre and Dr. Richard Sterling were among the LimmudLA participants who appreciated Israeli General (ret.) Shimon Erem explaining his boss David ben Gurion's ideology to nurture alliances with gentile friends supportive of the Jewish national refuge.